Primates are present in America, Africa, and Asia, but gorillas live only on the African continent, where they are native. All gorillas in the wild live in the central region of Africa, but its distribution range is not continuous. What does this mean? Well, different populations of gorillas are settled in various parts of Africa, but the Congo River and its tributaries separate both species. One species, the western gorilla, lives in a region located in central Africa toward the west of the continent, while the other named eastern gorilla, inhabits a territory also in central Africa but at the east. There are several reasons why there is such a division. One is the presence of the Congo River, which flows from the Democratic Republic of Congo eastward through the forest of the same name. The river forms a natural barrier between the two species of gorillas, which by the way are animals that cannot swim. Therefore, during the years, their ancestors evolved into two species with unique characteristics each one. The Congo river forms a natural barrier between the species of gorillas, which by the way are animals that cannot swim. Another reason for the irregular distribution of the members of the genus Gorilla is related to the intervention of humans in their territory. As you can already presume, the man degrades and reduces their habitat to perform agricultural or farming activities and to build human settlements. Consequently, the areas where the gorillas live are becoming smaller as human activities expand. Now, gorillas are present in the following African countries: Angola (Cabinda province), Democratic Republic of Congo, Cameroon, Central African Republic, Equatorial Guinea, Congo, Nigeria, Uganda, Rwanda and Gabon. The eastern gorilla inhabits only in Uganda, Rwanda and the Democratic Republic of Congo. The most widespread species is the western gorilla (Gorilla gorilla), which some years ago had an almost continuous distribution from the Central African Republic to the Congo River. 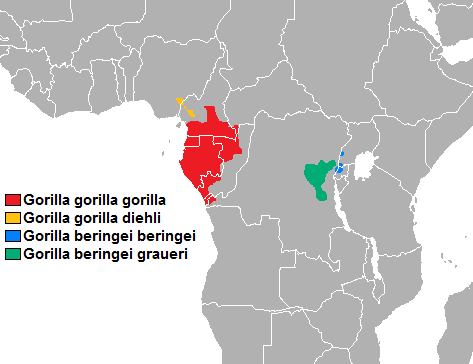 Distribution of subspecies of gorilla. Autor: Fobos92. Distribution according to the subspecies. Each species has two subspecies, which have particular distribution areas. The western lowland gorilla (Gorilla gorilla gorilla) lives in Cameroon, Gabon, Central African Republic, Congo and Equatorial Guinea, to the Oubangi River. The Cross River gorilla (Gorilla gorilla diehli) is the subspecies with less range; it lives in a tiny area between Nigeria and Cameroon in the upper basin of the Cross River. The western lowland gorilla is the most widespread subspecies and the Cross River gorilla the one with the smaller range of distribution. The eastern lowland gorilla (Gorilla beringei graueri) inhabits the east of the Democratic Republic of Congo, near the border with Rwanda and Uganda. The mountain gorilla (Gorilla beringei beringei) lives in Rwanda, Uganda and the Democratic Republic of Congo. 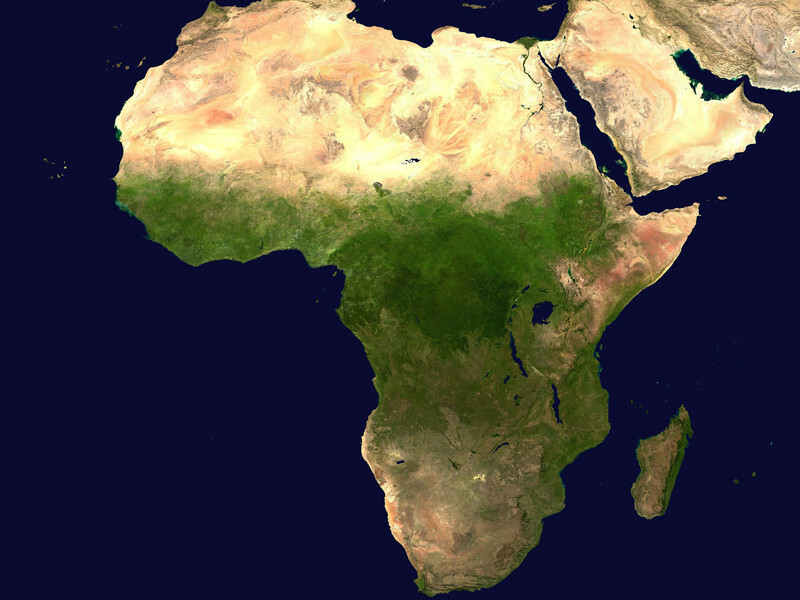 The irregular distribution of the subspecies is visible if you look a map of Africa. Several small spots east and west of the continent are the places where each of the subspecies lives, being the western lowland gorilla (Gorilla gorilla gorilla) the one having the larger range of distribution. In contrast, the mountain gorilla, with only two groups, has a population of only a few hundred individuals. The areas where the gorillas live are diverse, and so the characteristics of each subspecies. If you want to know about their habitats, please continue in this section. Gorilla habitat. Martha M. Robbins, Pascale Sicotte, Kelly J. Stewart. Mountain Gorillas: Three Decades of Research at Karisoke. Cambridge University Press, 2005.